According to the website for the Museum of Talking Boards (a.k.a. Ouija boards) “modern spiritualism” began in Hydesville, New York, in 1848, when sisters Kate and Margaret Fox (ages 12 and 15, respectively) claimed to have contacted the spirit of a dead salesman. 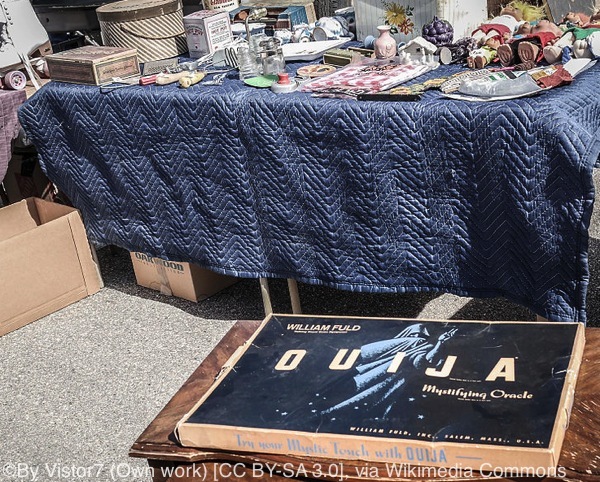 The method they used for communing with their spirit friend is known as “rapping”—that is, getting the spirit to rap or knock on a table during a séance. Messages could be spelled out this way by asking a spirit to knock once for “A” twice for “B,” and so on. Although Margaret later claimed the whole thing was just a hoax and even went so far as to demonstrate their methods to the public, the idea of speaking to the dead had already spread like wildfire across not only the United States, but also Great Britain and other European countries. Since the dawn of human history, the idea of spirits has fascinated people, and many have sought ways to communicate with those who have passed over to “the other side.” Even after the Fox sisters were debunked, other mediums (called such because they acted as intermediaries between the living and the dead) continued to refine their methods of communicating with the deceased. Automatic writing replaced rapping; a pencil was attached to a small basket, and the medium would place his or her fingertips on it and allow the spirit to take over and write out their message. Automatic writing is still practiced by psychics today. Eventually, the heart-shaped planchette, or “little plank,” which was used to point to letters already printed out on a board, replaced the basket and pencil. This, of course, was the original Ouija board. The first patent for a commercially produced “talking board” was filed on May 28, 1890; it lists Elijah J. Bond as the inventor. If you are interested in the paranormal, check out America’s Haunted Road Trip books, a one-of-a-kind series of haunted travel guides. Each book profiles more than 30 haunted places open to the public. From inns and museums to cemeteries and theaters, the author visits each place, interviewing people who live and work there. Each guide also includes travel instructions, maps, and an appendix of 50 more places the reader can visit.